It’s called a demo because it’s not done. One of the things that was shown off during gamescom last week was the character creator for Guild Wars 2. Well, I suppose “shown off” isn’t precisely the right way of putting it, but it was the first time that people were able to really give it a go. If you go on youtube, you’ll find a ton of videos showing how it works. This particular video by the lovely people of Wartower goes through and shows just about every option currently available in this demo. The key there, though, is that it shows what is currently available. It’s very clear that the creator is not finished yet. It was also stated by ArenaNet that the creator that was part of the gamescom demo was a very stripped down version so that people wouldn’t spend their entire allotted demo time just playing with that. Which is understandable – I know that when I get the game, I’ll spend far too long just making my characters and getting them looking as I want. It’s also pretty obvious in looking at the videos that some races are further along than others. Humans had most of their options available, while sylvari had almost none. Asura and norn had a decent number of options, while charr had fewer. Only humans had any sliders available at all, and those were only a small number of what we’ll have available at launch. And that’s fine. It’s just part of a demo; intended to just give a little taste of what you’ll be able to do when it’s complete. Of course, this fact hasn’t stopped the detractors. There’s a fairly long and heated threat on Guild Wars 2 Guru about this very subject. Some of the complaints I can definitely see as valid. The faces for female humans and norn for example – they’re all very typically pretty and tend to have way too much makeup. This is not a bad thing in itself, but they all look extremely similar. A bit more variety would be nice. Yes, I can definitely understand wanting a certain artistic aesthetic, but there’s more than one type of beauty. Look at the real world – Emma Stone and Cate Blanchett look very different, but both are very beautiful women. Allow us more variety in the faces we have. Don’t tie makeup/scars/etc. to face selection – make that separate, if possible (for that matter, extend scars to the body as well – we can pick body tattoos for norn, why not scars as well?). I’m quite sure that in the final version we’ll have far more options than are available in the demos right now, and the presence of sliders to customize the presets will also help, but I can understand people being a bit disheartened by the fact that all of the faces we’ve seen as of yet are standard model beauty. But that doesn’t mean that all of the complaints I’ve seen really have any steam to them. Female norn, again, are something that are being debated fiercely. They just look like tall women, people say. Okay, this is true to some extent. However, we haven’t seen the physique options available for them yet. And even without that…the typical female norn we’ve seen has not had the same proportions as the human women in-game. See the image of the norn woman above – no, she’s not the hulked out being that a male norn is, but she’s still clearly quite muscled, and doesn’t have the small waist that is standard in human beauty. The proportions are different than a human’s. And a Thief, or a casting profession? It wouldn’t make sense for them to be as muscled as, say, a warrior, anyway. That’s an area that I’d like to see all of the options we’ll actually have in-game before I start complaining. The other big complaint I’ve seen is the fact that eye colors are linked to face selections. An ArenaNet employee did pop up in the thread and say that it was due to technical limitations, though later clarified that it might not be as impossible as she had thought, though still could make no promises about being able to select eye colors independently. The fact that there’s some technological reason that makes separating the two doesn’t surprise me – we all remember the fact that in GW1, you cannot dye a blindfold because it passes through the hair. I’ve seen the fact that GW2’s creation engine is based on Aion’s as reasons why this should be possible…but as I recall from my time playing the Aion beta, eye color selection was not initially available. It was something added in later. Add in the fact that GW2 runs on a different game engine than Aion could also raise difficulties. Sure, it’d be great to be able to pick what color eyes my characters all have, but in the long run, it’s not a huge deal. Is the current character creator for GW2 perfect? No. But is it finished? Also no. We haven’t seen all of it yet (we’ve seen VERY little, in fact), and probably won’t until the game is ready. We already know that ANet continues to work on and polish things constantly. Personally, I think that in the end, it will turn out great, as I’m already pretty damn pleased with what I’ve seen so far, even if there’s still plenty to be worked on. I’m sure they’re working just as hard on that as they are everything else. What do you think of what we’ve seen of character creation so far? What would you like to see available? Only minutes ago (literally – I’ve been watching the ArenaNet blog page and twitter like a hawk) the new sylvari design was revealed. And I don’t know about everyone else, but personally, I couldn’t be happier. They are a perfect blend of plant and fae – the humanoid structure is still there, but it’s also very clear looking at them that they are very much not human and are in fact made up of branches and leaves and are sentient plants. They follow features of plant anatomy (such as ‘growth sockets’ like you’d see on a plant growing from a tree or vine), and leaves create the forms of muscles. Even clothing continues with this natural growth-based design; it’s not simply a case of taking a design for an outfit and replacing fabric with leaves and vines. Even the lines and flow of the clothing and armor matches how a plant would grow in nature. Of course there’s plenty of room for customization, as well! 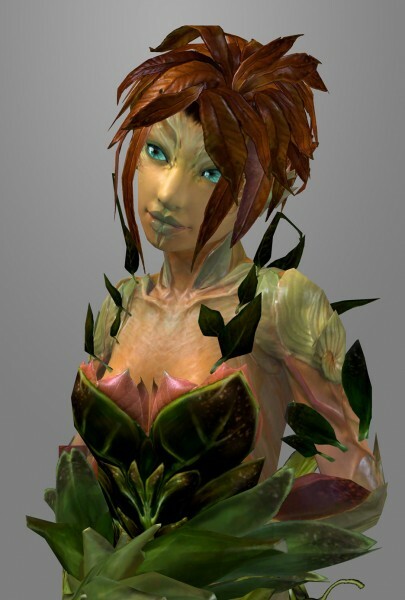 Seasons will not tie into your storyline, but they will definitely influence a sylvari’s appearance, with summer sylvari being very green and lush, and winter sylvari which are barkier (this is now a word) and have more branches and roots than leaves. Spring and fall will of course fall in the middle of the two. Oh, and don’t forget leaf patterns for the skin and bioluminescent markings. All in all? I’m more than happy with the new appearance. Especially since they managed to hit nearly every thing I said before that I would have liked to see in the new design. Bring on the rest of sylvari week! What is your favorite part of the new design? Playing with friends? Hell yes. Now, I’ll be the first to admit it. When I play Guild Wars, I avoid PUGs like the plague – the few I’ve participated in have been unqualified disasters. 99% of the time I just load up a party of heroes and set out. But sometimes, it’s fun to grab a few friends and go tackle the world. My guild leader and I played through all of the missions together, up until EOTN where we pretty much did it at our own pace. My brother and I will join up every so often to go and do a dungeon or quest. The one and only time I did Underworld? Was just after the Dhuum update and a handful of us from the art forum on GWG decided we were going to prove that it could be done by a team that wasn’t just a bunch of speed-clearing Assassins; we were probably one of the first groups to defeat Dhuum. And you know what? It was a blast. I remember one of our (failed) attempts at UW where not everyone had arrived, we didn’t get heroes for the missing people, no one had swapped to the right builds, and one of the people in our group teleported us in with a scroll. Five of us, no healer, a warrior with a running build and a minion master…and we cleared half the UW. When we got to the Chaos Planes we just…decided to chill out there and chat on vent for an hour. And, y’know, be slightly ridiculous. But it was fun. We popped a summon stone and got the Black Beast, who lived up to it’s name and was a freaking beast (he was solo-ing Aatxes and winning! 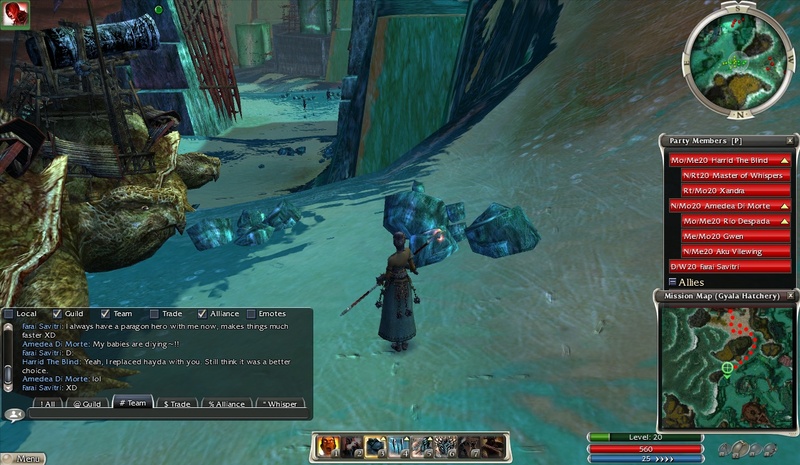 ), we played chicken with the traps set by Obsidian Behemoths to get gold…just screwing around. Of course, when we did it for real, even though we took it a bit more seriously, we still had fun. Chasing Aatxes and calling them “kitties”, discussing fuzzy Monk pants, yelling at Dhuum to turn off the capslock and go to sleep, suiciding with a vampiric weapon someone had with them so that we’d turn into ghosts after we defeated Dhuum…it was a genuinely hilarious and awesome experience, and it was so much fun. And I can’t forget all of the dire threats made against the spiders in Fissure of Woe when my guild leader and I did that…the near-wipe from bad aggro saved by my candy addiction in-game and stock of candy canes and rock candies…exploring every inch of it looking for chests…and also us getting completely lost due to my inability to read a map off of wiki. Whoops. But still, it was an entertaining run, and we got it done in the end! But since I’ve finished all of the campaigns and the seven hero update was added, most of my time in-game has been just me by myself. I mean, I’ve mostly been vanquishing when playing; really not that interesting, and I’m sure that my attention span would annoy anyone I was playing with (aka, I get distracted incredibly easy). But last night I joined @TriggerSad and @Arkenbon to do Gyala Hatchery in Factions. And you know what? It was a lot of fun. Even though we basically jumped in and went once I joined, we had no problems. We tore through that mission with no problems, and would have gotten it done in half the time if those turtles weren’t so slow 😛 It was definitely a good time! Unfortunately, I missed tonight’s outing because I was at work. And my opinion on PUGs remains the same – no thanks. But playing with friends and people I know? Yes please! Things have been a bit quiet on the news front lately, but a deluge was promised us recently – during San Diego Comic-Con it was announced that the sylvari and asura will be playable during the PAX and gamescom demos, PvP would be demoed then as well, and that sylvari week would be coming very soon. Today it was confirmed that sylvari week will be next week. Being the sylvari fan I am (who could have guessed! :P) I am of course quite excited about this little bit of information, and you can guarantee that I will be all over everything next week! Finally we get to see the new design! We’ll learn more about the lore of the sylvari! And if previous race weeks are anything to go by, we’ll also get a glimpse of how they were created and designed – this I especially can’t wait to see. So, rest assured, I will be posting next week about everything revealed to us! What are you looking forward to learning about the most?